John would tell us: ‘In the beginning was the Word, and the Word was with God, and the Word was God’. Upanishads (a sacred Hindu text) say that the divine, all-encompassing consciousness first manifested as sound ‘OM’, the vibration of the Supreme. Everything has its own frequency. Pythagoras created his musical scale starting with a note A (just next to the middle C) that resonates at the frequency of 111Hz. Perhaps this one note contains many overtones like white light that contains all the colours. Perhaps it is a Cosmic ‘I love you’ that is within all of us. 111Hz is a frequency of a low male voice. Paul Devereux is a professor from Cambridge and an archaeo-acoustician who researches the area of archaeology and acoustics and who has visited ancient sites and temples analysing the ritual use of sound. He’s discovered that burial mounds in Ireland called Cairns, even though they are made of different materials, and are different sizes, all resonate at one particular frequency, of: 111 Hz. He has decided to take it a step further and explore what happens to the brain when it is exposed to the frequency of 111Hz. Findings of MRI scans suggest that at exactly 111hz, the brain switches off the prefrontal cortex, deactivating the language centre, and temporary switches from left to right-sided dominance, that is responsible for intuition, creativity, holistic processing, inducing a state of meditation or a trance. The Maltese Hypogeum is a temple hewn out of the rock during 3600-2500BC that covers some 500m2 with the lowest room being around 11 metres under the ground, mirroring Temples above the ground that are the oldest free standing structures on Earth. Testing that analysed the sound within the Oracle Chamber in the Hypogeum found to match the same pattern of resonance at the frequency of 111Hz. Seven thousand years ago, a thousand years before the Egyptian pyramids, in the Mediterranean, in Malta, an amazing culture seemed to be flourishing in peace and harmony for 2,500 years. Within the remains of their times, no evidence of weapons, or defensive architecture was found. The bones analysis suggests a healthy population. Their cult seems to have rituals that are life affirming, earth and nature oriented, worshipping Great God/dess, experiencing the divine as both feminine and male, attuning to the natural rhythms and cycles of Sun, Moon and Earth, and the change of the seasons. 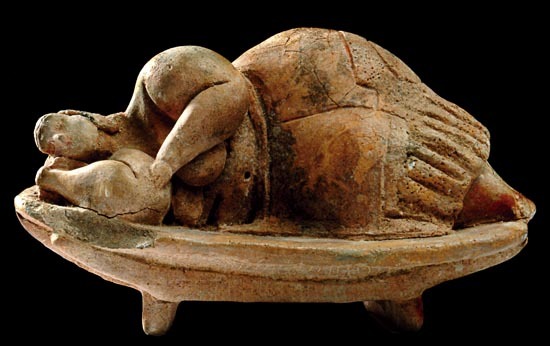 These neolithic people were certainly not savage cavemen. Similar skulls were found within Mayan temples, and in the ancientMesopotamia and Egypt. Professor Walter B. Emery, an Egyptologist, discovered somedolichocephalous skulls, in Egypt. Emery believed that this ‘race’ was highly dominant aristocracy that governed entire Egypt, mixing only with the aristocratic classes and the scholar associated them with the Shemsu Hor, the ‘disciples of Horus’. 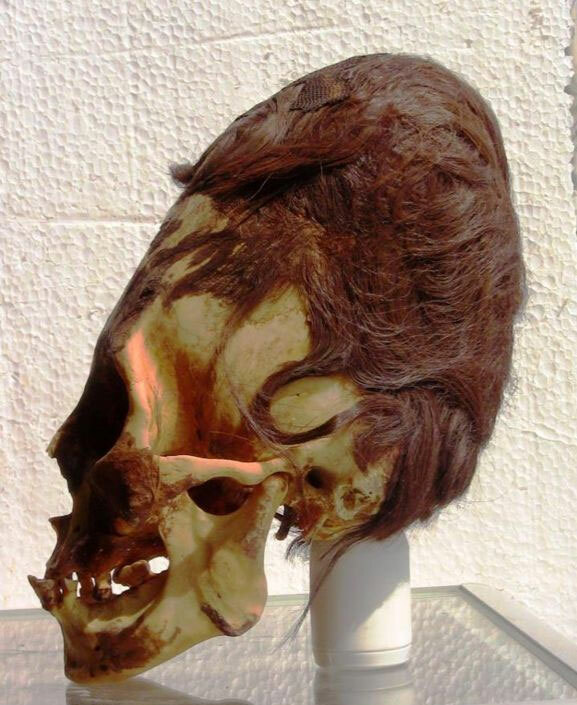 Above image is of anelongated skull found in Peru. It is interesting that in Lower Egypt, the pharaoh's symbol is abee. Malta's ancient name is ‘Melita’, the Latin word for honey. The ‘serpent priest’ tradition is also found in the Middle East,Kurdistan, where at around 5000BC we find the goddesses represented with faces of vipers and lengthened heads. In Egypt, pharaohAkhenaton (around 1350 BC) and his royal family, were portrayed as people with lengthened head and snake-like faces. The X-rays ofTuthankamon's skull, Akhenaton's son, showed adolichocephalous cranium. When Saint Paul shipwrecked in Malta, he writes that a snakebit his foot... This could have been one of the last ‘serpent priests’ of theGoddess on the island.